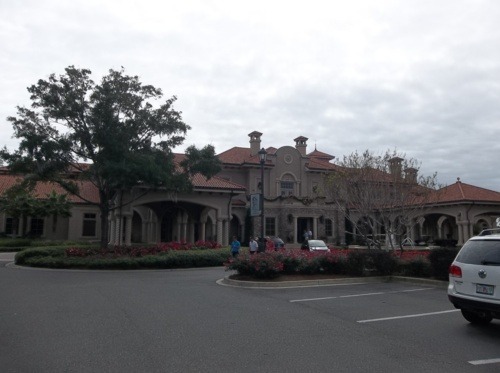 So here we are, the main reason I took this trip: TPC Sawgrass. 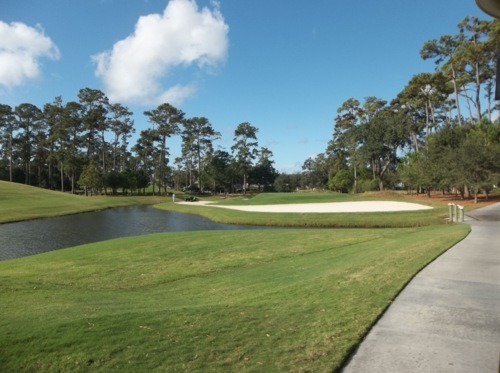 It’s on the bucket list of most every avid golfer. It was definitely high on mine! I wanted to do something a little special this Thanksgiving, so I headed off on this little golf adventure on the other side of the country. Originally, I was going to start at Sawgrass and then work my way up the coast, but the planning worked out better with this as the grand finale of the trip. The only problem with this plan was physical fatigue. 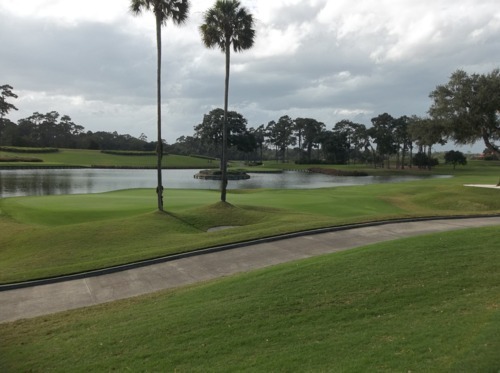 My right forearm was really hurting, my back was sore and I was pretty tight from head to toe after playing 72 holes before I even started my stint at Sawgrass. Nothing would stop me from playing here, though, so I dismissed any pain and got fired up for each round. 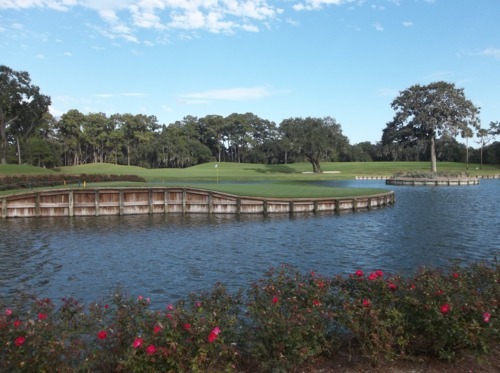 There are two courses at TPC Sawgrass. 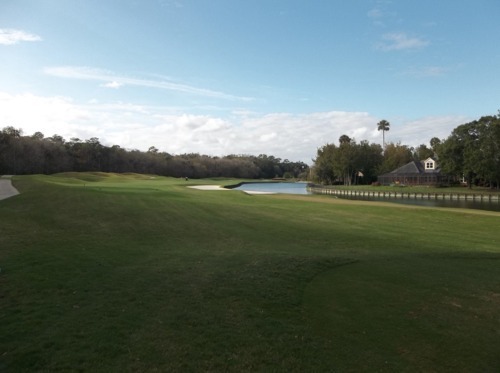 One is the famous PLAYERS Stadium Course that you can see on your TV every May as the “fifth major” championship on the PGA Tour—THE PLAYERS Championship. 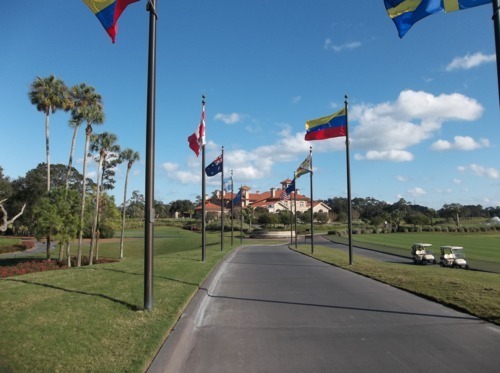 Pete Dye designed this masterpiece to be home to this annual event and Sawgrass itself is the home to the main PGA offices (some located within the clubhouse, some just right down the street). 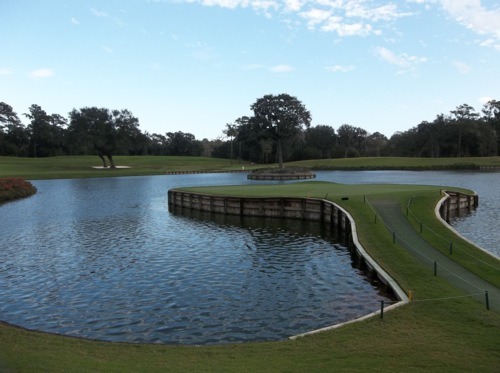 And of course, everybody knows the 17th hole—the famous island green. 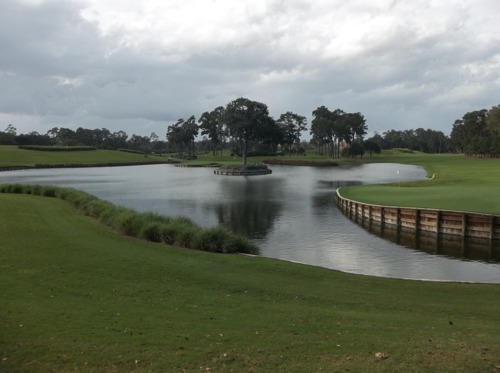 The other course at TPC Sawgrass is called Dye’s Valley. 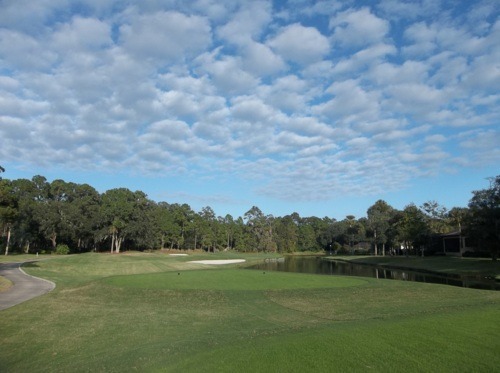 It was co-designed by Bobby Weed and Pete Dye. It should definitely not go overlooked because it is also a great course. Dye’s Valley is where I was playing first. 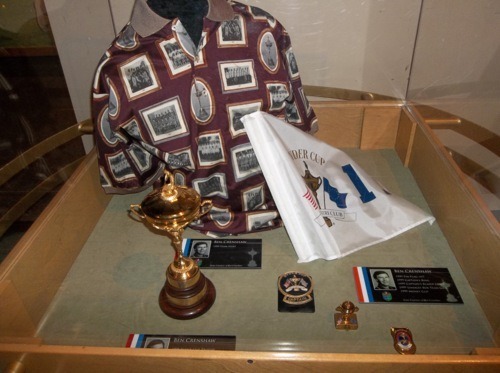 I had a 2:05 tee time on Sunday, but was at the course pretty early to walk around the massive clubhouse, look at all the PGA/PLAYERS memorabilia and soak in the experience. 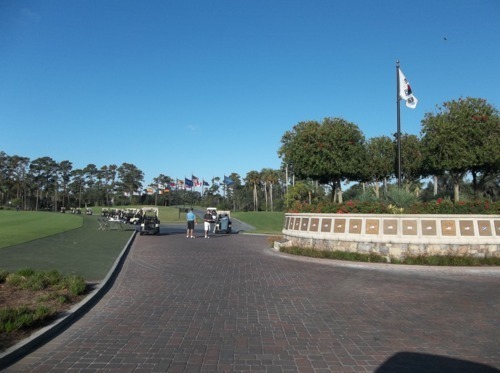 I checked in early, and after a quick bite to eat at the snack shack, I eventually worked my way over to the first tee of Dye’s Valley (which is a little further away from the clubhouse than the Stadium course). I checked in with the starter and hit a few practice putts while waiting. With this being an afternoon round, I was hopeful I might get out a little early to get in all 18 before it got too dark (around 5:45 pm this time of year down there). This first round had to be a twilight time based on the stay and play package I signed up for. Luckily, the starter had an opening for me and I teed off a little after 1:30 with a father and his teenage son. 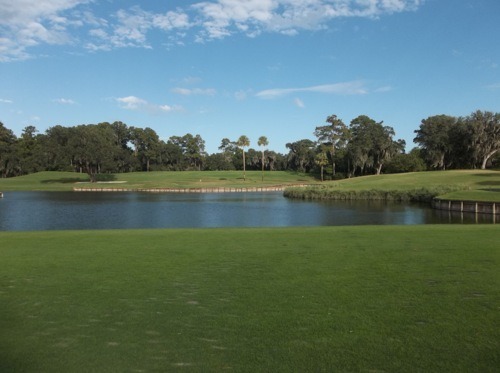 I learned the father worked for the PGA, so he gets some great discounts at the Sawgrass courses. There really wasn’t anyone in front of us, so the round went quickly. It wasn’t until hole 16 where we caught up to anyone. The last three holes went really slowly, but we still finished by 5:15, so no worries. 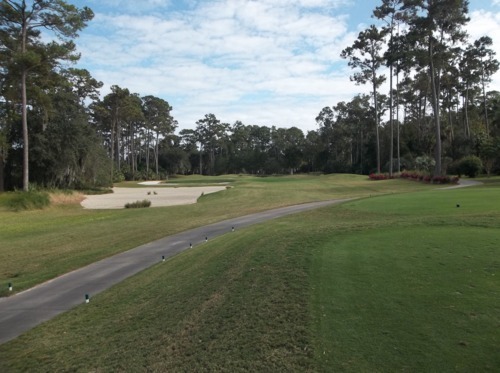 The Dye’s Valley course was in really good condition. The tee boxes, fairways and greens were all in excellent shape. The rough was a bit dried out, but fine. Speaking of the rough, that is the biggest challenge of this course. It is thick, deep and hard to hit out of. You have to watch your shots carefully when they go into the rough, otherwise it’s very easy to lose your ball (it would just sink down out of sight almost every time). The other distinctive feature of this course is the mounding. 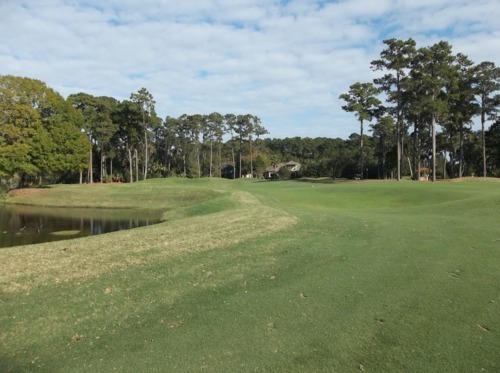 The fairways are pretty even for the most part, but as soon as you get off the fairway you’re likely to be playing off of a very uneven lie in some nasty rough. Very tough. 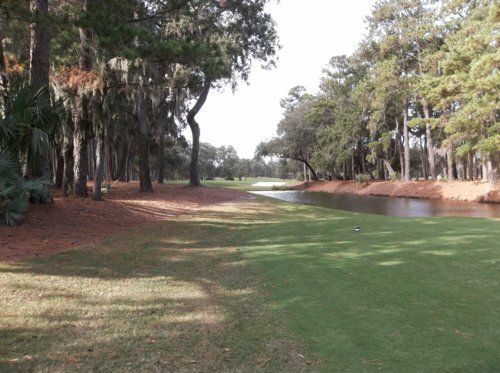 The course isn’t super long, but most holes are big doglegs and there is a lot of water in play (more, in fact than on Stadium). I would call Dye’s Valley a real shot-makers course. If you stay safe, you have the chance to score pretty well. I was hitting mostly fairways this day and I was able to shoot a respectable 86 (my best round of the trip). 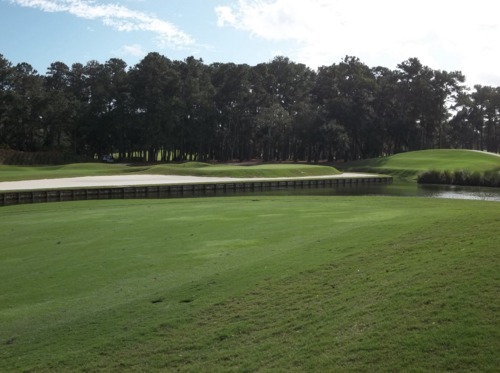 Visually, it’s similar in style to the PLAYERS Stadium course, so it’s a very nice complement to its big brother. I actually played Dye’s Valley again as my final round on Tuesday the 29th. The first time I played the white tees and was hitting well. 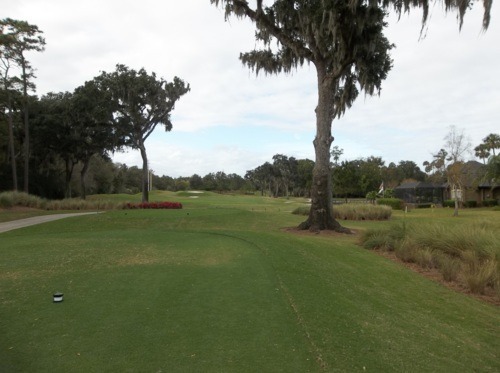 The second time I played the blue tees and was not hitting well, so it was a vastly different scoring experience. 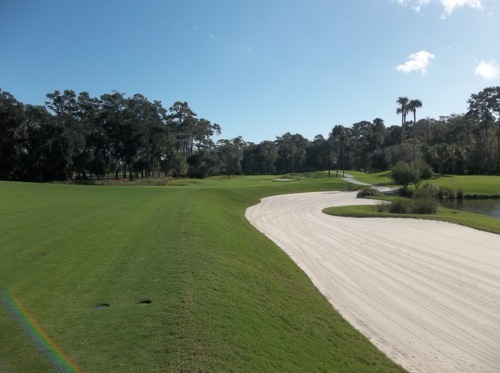 To me, that’s always a measure of a good course design—knowing you can post a good score if you are playing well, yet if you are off your game the course will definitely punish you. In my room at the Marriott, there was a “Jacksonville” magazine with a cover feature story about the best local cheeseburgers. Needless to say, I was craving a good cheeseburger. After thumbing through the article, the one that caught my eye was at a place called The Loop. After some research on my phone, I discovered that The Loop is a pizza/burger chain in this part of the country and there was one only a few miles from my hotel. I went there Sunday night. The burger was okay. Pretty good, but nothing spectacular. Really good onion rings (though they didn’t give me very many) and a solid Oreo shake (hard to mess that up). Monday morning, I got up bright-eyed and bushy-tailed. 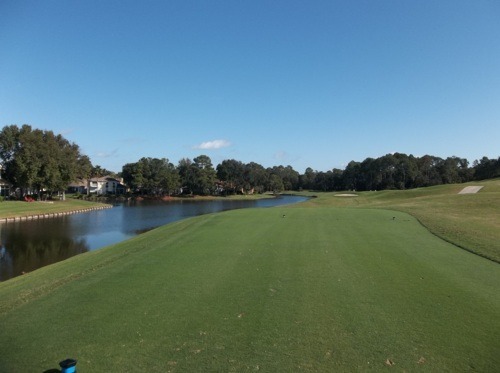 Today was the day I’d be playing the PLAYERS Stadium course at Sawgrass. My right arm really hurt, but I didn’t care. I had breakfast at the hotel and it was awful. They had a breakfast buffet for $19.95 or you could order off the menu. The standard “All-American” breakfast combo (eggs, choice of meat, potatoes and toast) was priced $18.95, which was pointless. I really didn’t want to eat a ton, but the buffet was the only way to go. 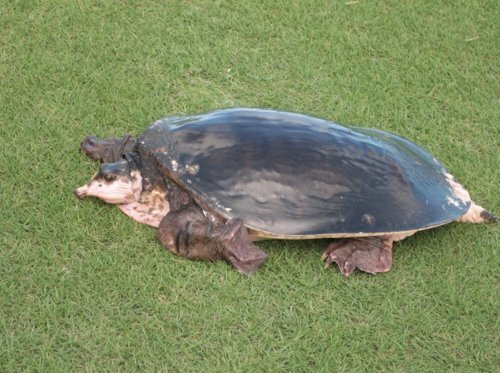 Everything was pretty gross. Runny eggs, bland potatoes, greasy sausage—not a good way to start the day. But, hey, at least it kept me from eating too much! My tee time was at 10:00. Since this was my only round today, I figured I’d get a perfect late morning/early afternoon time to savor the experience. Also, they had a pro-am tournament going on both courses Monday-Wednesday, so I was due to go off after that. 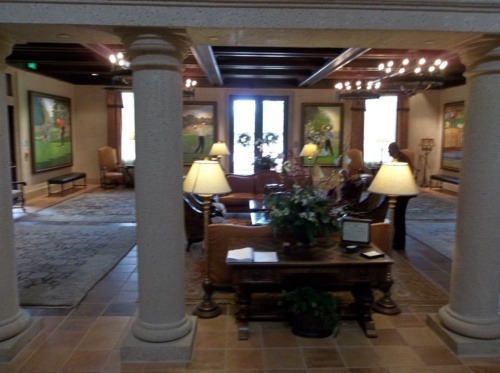 The courses and clubhouse were extra crowded this day because of the event, but as long as I had my time I was fine. Now, one big thing to note regarding this round was the weather. 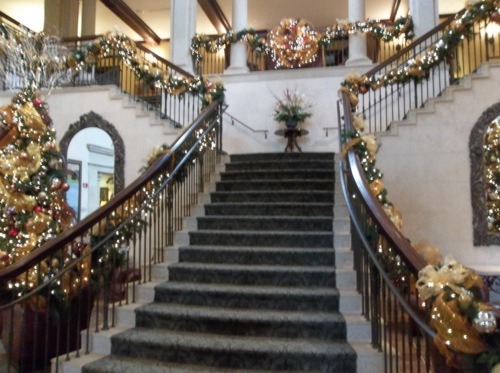 I had booked everything pretty well in advance, so all times and days were locked in. However, as the trip drew near and I began looking at weather forecasts, Monday was looking like it was going to be the worst day. Heavy rain and thunderstorms were supposed to hit that day and it wasn’t changing. Even Monday morning, I got up and watched the weather forecasts on the local news and it didn’t sound promising. However, when I looked outside my window, there wasn’t a cloud in the sky. At the course, the weather was beautiful. Perfect sunny morning with just a bit of wind. Nobody there seemed worried about the bad weather coming in until later that evening. As the day went on, the wind picked up and was howling most of my round, which made a tough course even tougher. On the back nine, the clouds started rolling in a bit, but we avoided rain. It wasn’t until I was back at the clubhouse and getting into my car that I felt my first few drops of rain. So it all worked out in terms of weather. They were putting people off on both nines, but I was happy I was starting on number 1. 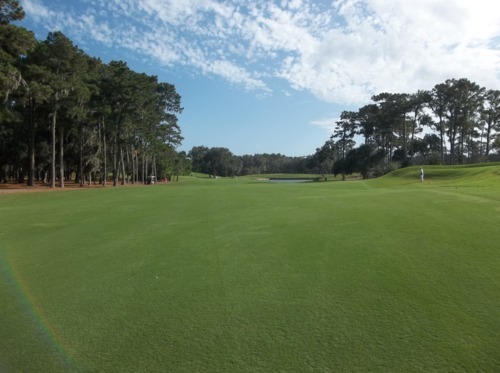 I wanted the anticipation to grow as I got closer and closer to the famous finishing holes. I was grouped with a nice, fun couple from London, England and it was their first time playing here, as well. We met our forecaddie, Jason, who looked a bit like a young Hal Sutton and was a good caddie. 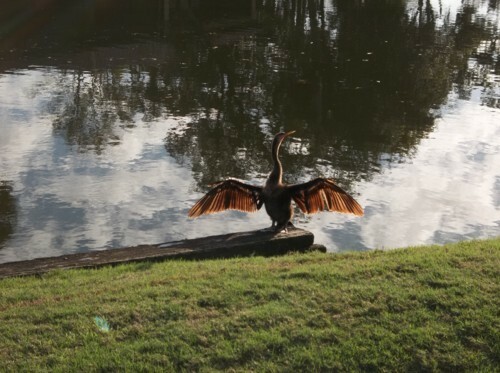 He knew when to help and when to back off and just let us enjoy the surroundings. I did not play well this day. I was spraying the ball all over the place and not really getting any distance out of my drives (see: fatigue), so the course played really long. The starter and the caddie strongly urged us to play from the whites (unless you’ve played there several times before or were a scratch golfer). From the whites, the course isn’t too long, but accuracy is key. Like Dye’s Valley, it is a very fair layout. There is a lot of trouble to get into, but if you can play it safe you can do alright. 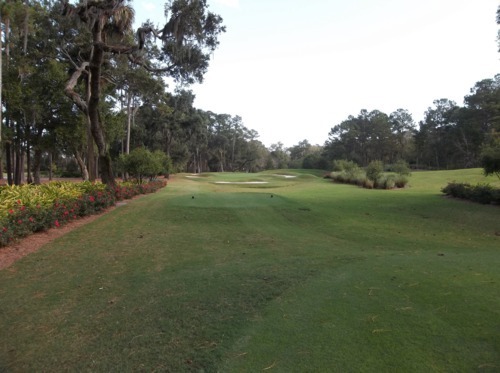 The course was in excellent condition and the rough was not as treacherous as Dye’s Valley. 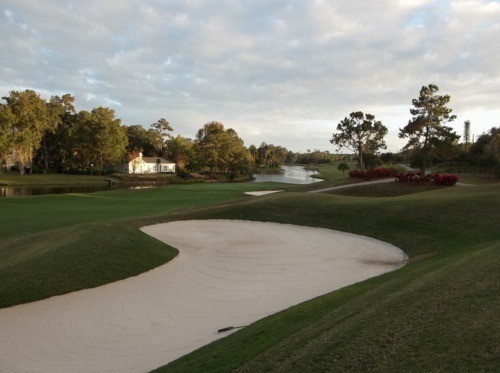 A lot of bunkers and hard-to-read greens add a lot of challenge to this course. In actuality, I thought the course would be a lot tougher than it actually was. It was still very challenging, but not as crazy as I made it out to be in my own head. That said, I did stand on several of THE PLAYERS tees, and from the tips it was a whole different vantage point on most holes. The round was pretty slow (about 5 hours because we were stuck behind that large tournament group), but I didn’t care. I was enjoying the sights and sounds. I wasn’t worrying too much about how I played. The great thing about the timing was that we were the last group off the front nine, so there was a big gap behind us. 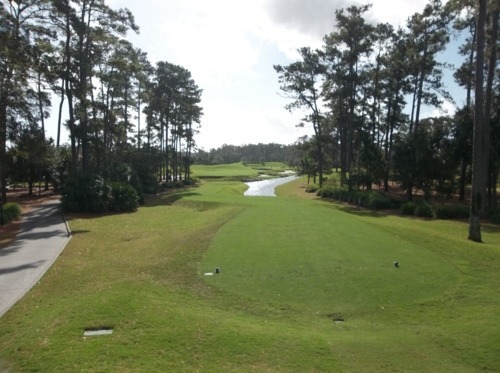 As we neared the Sawgrass version of “Amen Corner” (that was the caddie’s joke, which apparently doesn’t go over well with Augusta members he told us)—holes 16, 17 and 18—the pace slowed down even more as expected. 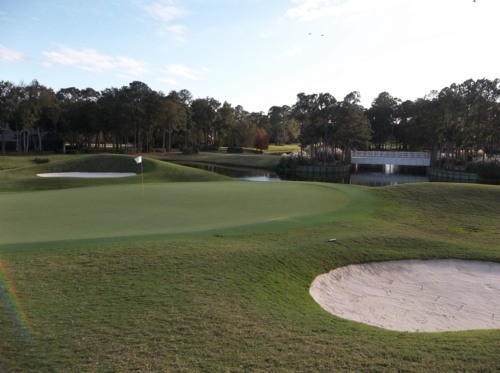 When they laid out this course, they did a really good job “hiding” the famous 17th hole. You never really get a good glimpse of it until you are right there. So it’s not until you are just about on the 16th green that you finally get a full view of 17 (which is awesome, by the way). There were a couple of groups waiting on the 17th tee. People on the green were milking it (posing for pictures and soaking it all in) and everyone took their time, which is understood. I knew I was going to want to take a bunch of pictures and was worried that I’d be holding things up, but with nobody behind us it was a perfect scenario. We played 16 extra slow and both the tee box and green of 17 was cleared by the time we finished that hole. We had the whole magical area to ourselves. The caddie showed us some great vantage points for pictures and we took our sweet time. There was no reason to hurry. We took a ton of pictures and by the time it came to hit my tee shot I was too preoccupied with everything else, I didn’t concentrate quite enough. 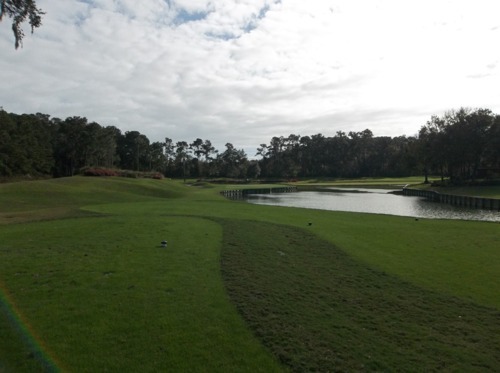 We decided to play this one from the blue tees, but it was still only 129 yards to the pin. 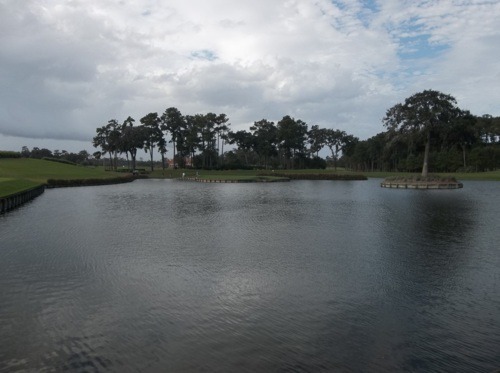 I hit a nice easy nine iron…right into the water short of the green. I went ahead and re-teed since we had the time and I put that one on the left side of the green. Unfortunately, the pin was on the far right side (basically the Sunday pin placement for THE PLAYERS, if you’ve ever watched it). Unfortunately, the putt was a lot quicker in my head. After all, having watched the same putt on TV so many times, I expected the ball to race off the top shelf and past the hole. I hit what I thought was a perfect putt (right up to the edge of the ridge), but it stopped a few feet short of the hole. I was surprised it stopped before the hole, but then again the greens were not set up for tour speeds. Oh well, I took my double bogey with a smile on my face. 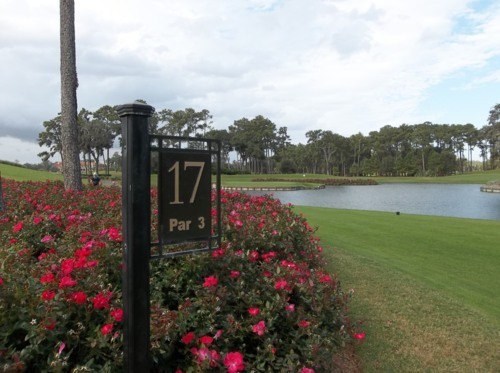 After the euphoria of 17 at Sawgrass comes the dread of 18. 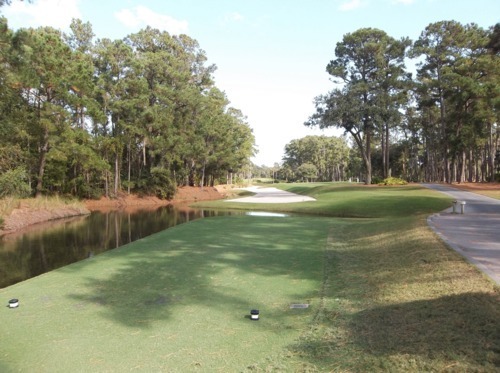 Talk about an intimidating tee shot! 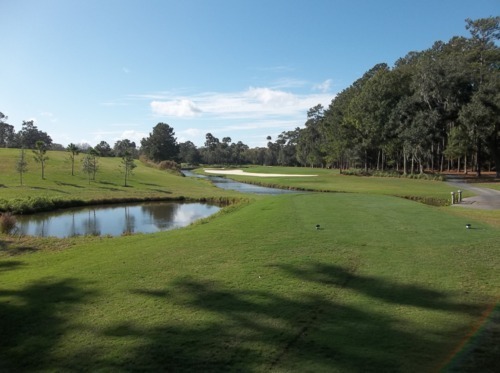 The water runs all the way along the left and it’s a pretty narrow dogleg fairway tempting you to bite off as much of the corner as you can chew. 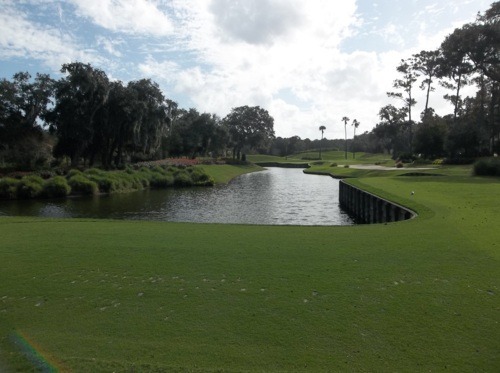 I went back to THE PLAYERS tee here for that vantage point. 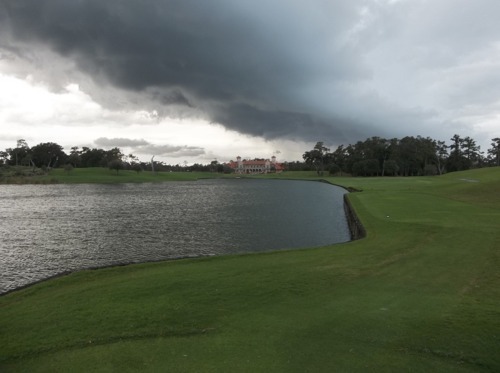 That was frightening, especially with the eerie dark cloud starting to form over the clubhouse in the distance. I stayed well away from the water and actually got on the green in two (only to three-putt). I was still happy with that result on one of the toughest holes around. What a memorable experience in a masterpiece of a course. I am so glad I had the opportunity to finally play here. 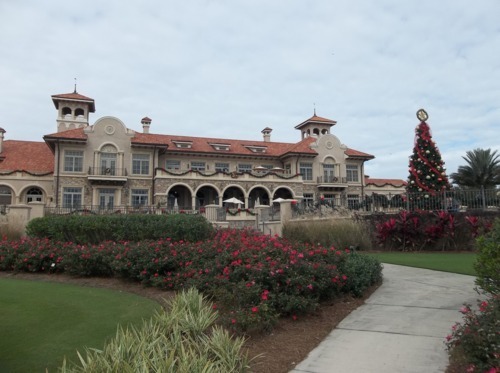 I had one other thing on the agenda this day: the World Golf Hall of Fame in St. Augustine (which I had been by the day before when I played the King & Bear Course—it and the H.O.F. 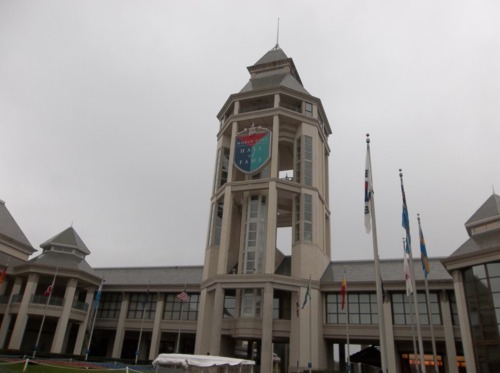 are both part of the World Golf Village there). I got there pretty late in the afternoon and they were only open until 6:00, but I figured I could get a decent run-through. Unfortunately, they don’t offer “twilight” rates. 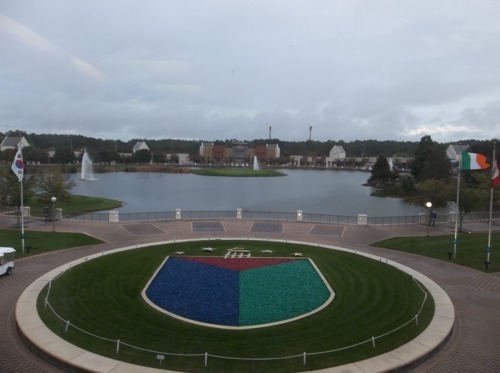 It was also raining pretty hard by this point, so some of the outdoor features (a real-grass putting course and a “hole-in-one” challenge hole) were closed down. However, I had plenty of time to go through all the displays inside. The Hall of Fame had a nice mix of displays. 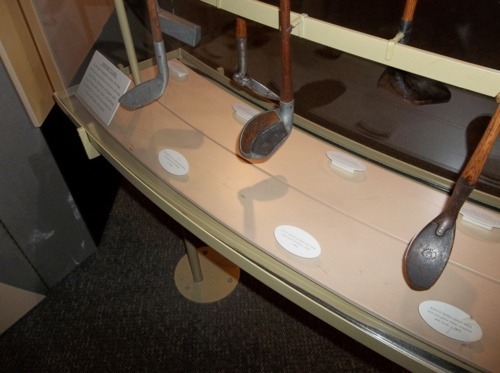 The opening gallery was a big tribute to Bob Hope, with a bunch of videos, pictures, trophies and memorabilia there to reflect his involvement in the game of golf. 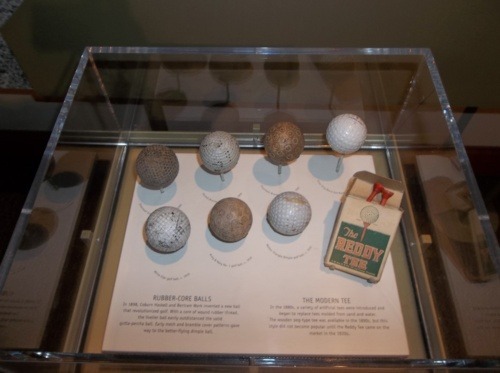 From there, you go into the history of golf (which I was most interested in). 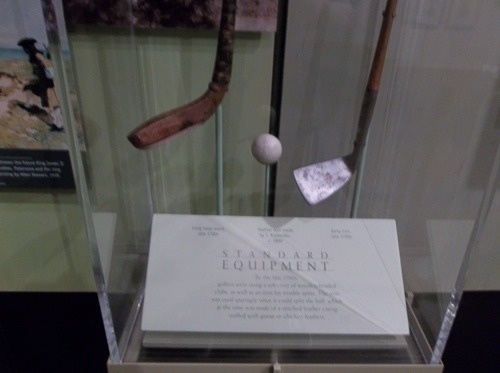 They had a ton of old-timey clubs, balls and pictures (some replicas, some originals) to show how the game and equipment evolved. 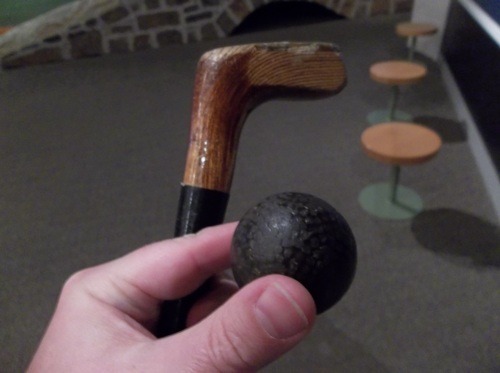 They even have a little putting green where you can practice your short game using old wooden clubs and old-fashioned balls. From there you get into the Hall of Fame displays. There is one big room. One side is all the plaques of the H.O.F. 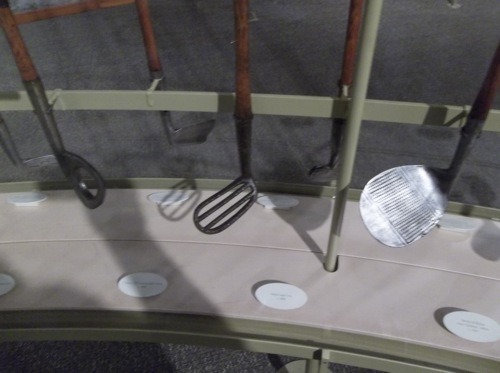 members and on the other side is memorabilia (clubs, bags, pictures, trophies) from this year’s inductees (including George H.W. 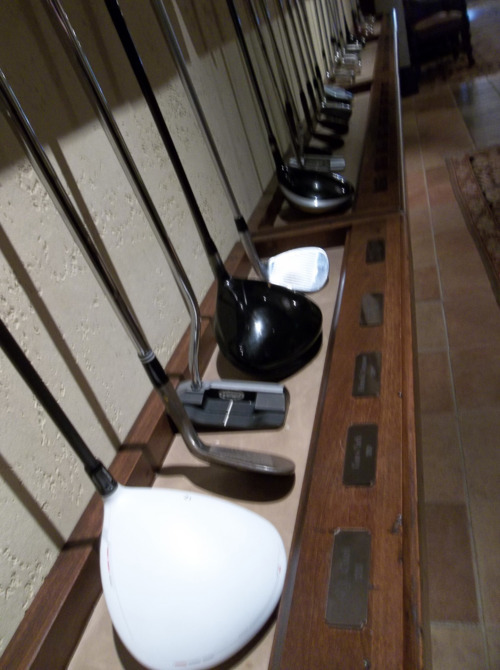 Bush, Ernie Els, Jumbo Osaki and others). 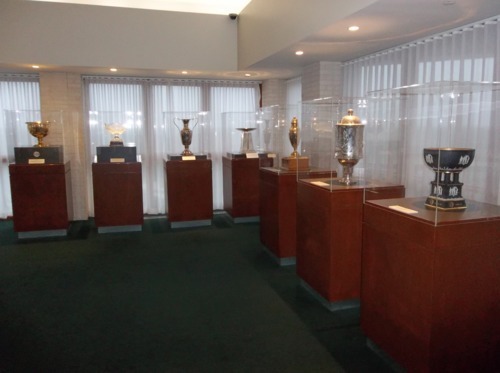 Then you go up an elevator into the Trophy Room, which features a bunch of famous trophies (most replicas I am guessing)—Ryder Cup, President’s Cup, Claret Jug, Wannamaker Trophy, Masters Trophy, U.S. Open Trophy and so on. Speaking of trophies, the actual FedEx Cup trophy was on display in the Sawgrass pro shop. 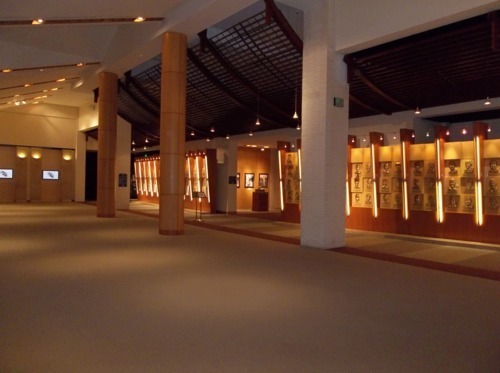 You go back downstairs and into the past Hall of Fame members’ area. There is memorabilia from every hall member in glass cases. 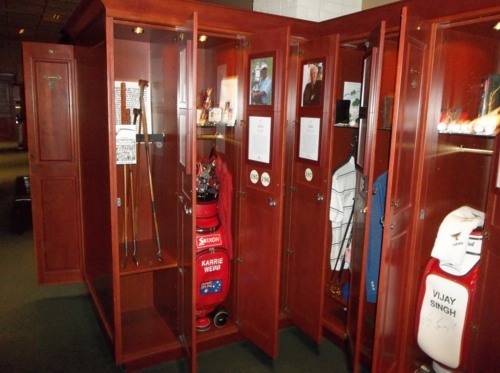 Finally, you go through the members’ “locker room” with each person having his or her own locker stuffed with more personal memorabilia. Very cool. Finally, what better way to wrap up my trip than a visit to a golf-themed restaurant. 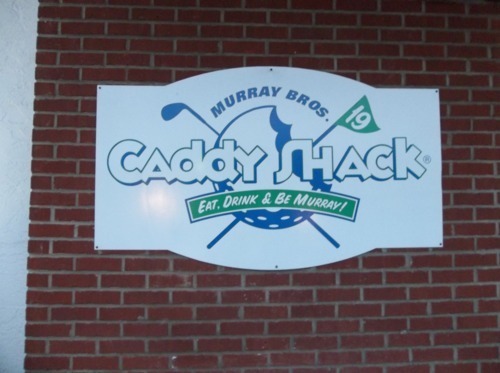 Right next to the Hall of Fame sits the Murray Bros. Caddy Shack bar/restaurant, owned of course by Bill Murray and his brothers. 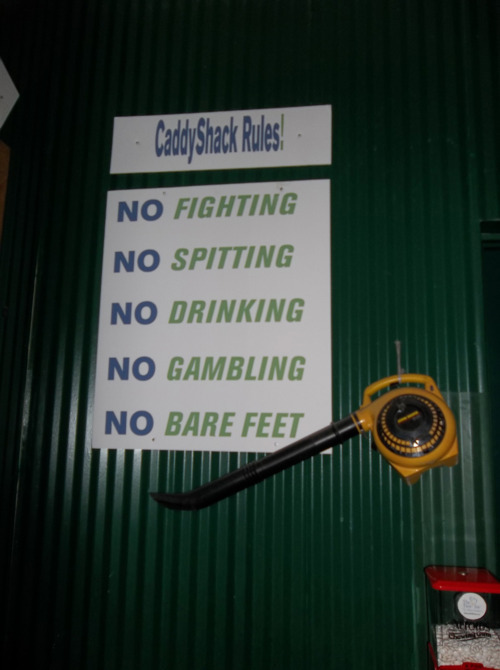 The walls are adorned with memorabilia from the movie “Caddy Shack” of course, some personal sports mementos from Bill Murray and a number of framed and signed bibs from tour caddies (including Steve Williams, Fluff and others). I was glad there weren’t any Masters coveralls from Steve Williams on display, though. That may have ruined my appetite since I’m pretty sure he goes commando in those things! I ordered a cheeseburger (running theme, I guess) that was pretty good. 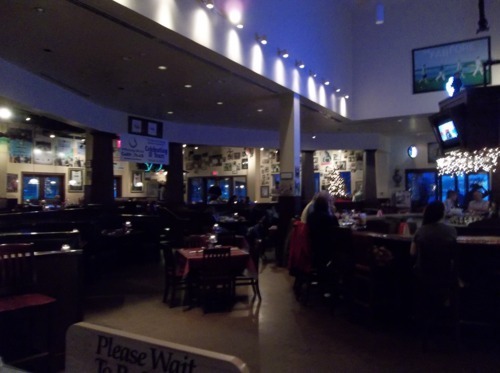 The menu had a few cleverly-named items like you would expect at a theme restaurant, but the one that made me laugh was a Baby Ruth Cheesecake, which isn’t too appetizing when think of the movie reference. 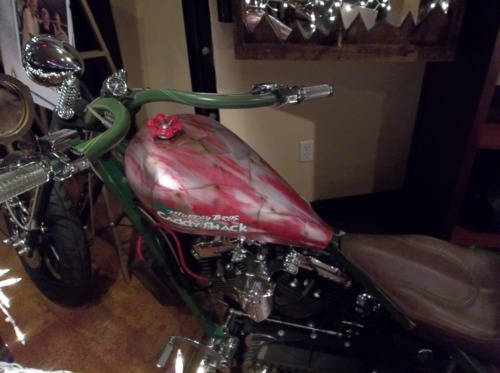 They also had the Orange County Choppers’ theme bike on display. I actually saw that episode of “American Chopper” when they built it. I thought it was one of the ugliest bikes they ever built and after seeing it in person, it still is (it’s kind of meant to be ugly, though). Tuesday morning (my last official day in town), I found the nearest local Waffle House. I’d never eaten at one before, but I figured since I was on a road trip in the South, it might be a crime not to at least have one meal there. It actually wasn’t bad. Solid food at a very cheap price—perfect for a breakfast “on the road.” It was way better than the Marriott buffet the day before, at least! 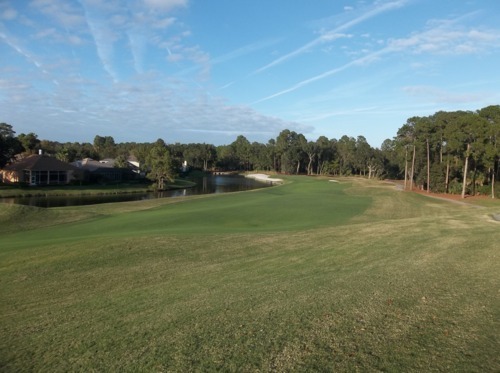 I did play Dye’s Valley again on Tuesday before flying home from Jacksonville that night. 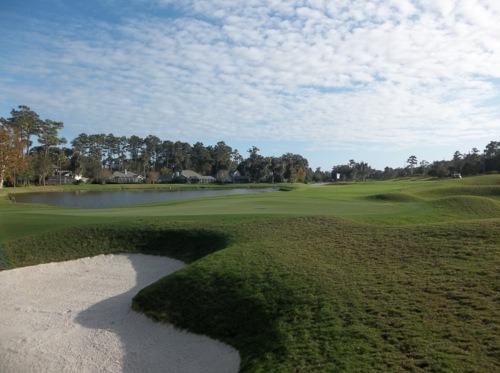 Nothing too noteworthy about the round and I was almost too exhausted to really enjoy it. Oh well. It was a great trip and almost everything worked out even better than planned. I am really glad I splurged to take this trip. I cannot wait until my next one.